We’ve been dancing frequently lately. We’ve been contra-dancing as a family, and Marathon and I have given swing dance a try too. Contra dance offers a family friendly setting. No dance partner or experience necessary. Lots of fun for people 9-ish and up. 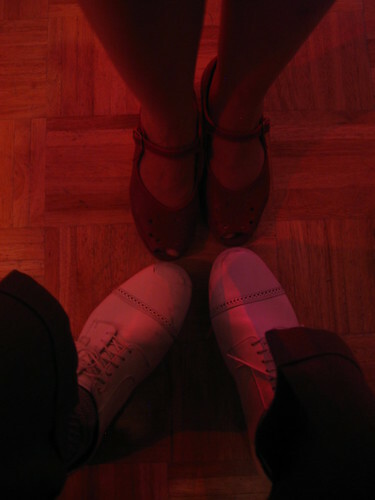 Since the caller goes through the steps before each dance, contra-dance seems like a great way to begin dancing. Swing dance is great for couples. The basic swing step is easy, but there are all these complicated twists and moves that can be integrated with (or used instead of) the basic swing step. Lots of room for creativity and learning with your partner. Next dance to learn: the shim sham. Frankie Manning makes this look so very fun. It is so much fun. If you contradance, take the kids. Watch a couple of instructional youtube videos, and you’ll be good to go.